Burglary is a gateway crime committed mostly by teens and young adults. It’s a category of crime like an oil slick—spread thin across the nation. There are millions of property crimes reported each year, but the number is thought to be double that. Sadly, only 10% of burglaries and thefts are ever solved. The MyPropertyID system is a private database for your eyes only. The police can only access the account with a subpoena and we never manipulate that data. Property is marked with a universal identifier which acts as a lost and found. Just like with a car, if you are the victim of a burglary or theft, you call the police and file a crime report. When it comes to portable valuables, the police can only help if you provide serial numbers of those stolen items. 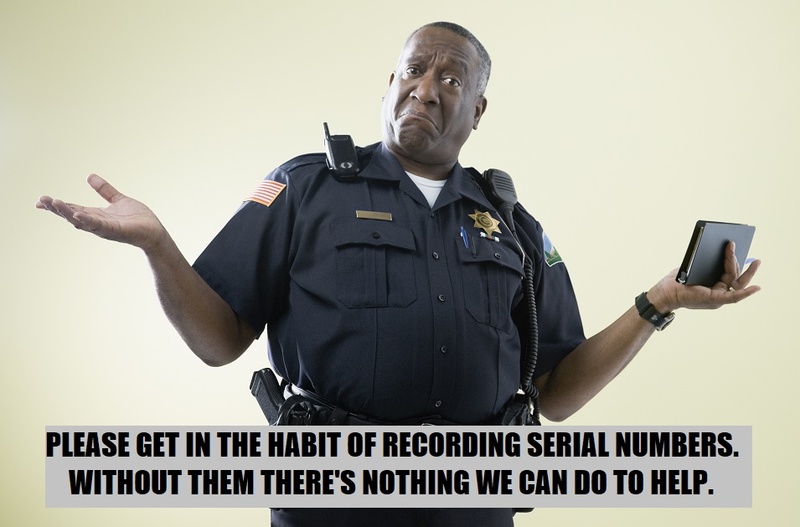 The serial numbers are then fed into FBI databases. If an item is brought to pawn shop or recovered during a police search, those items can be traced back to you, leading to an arrest and a conviction. If a Good Samaritan finds a lost item or a discarded stolen item with the asset tag still attached, they simply go to the Found page of our website, enter in the numbers, and an anonymous email is sent to the rightful owner. Look at the back of any corporate, university, government or hospital computer monitor, CPU and printer and you’ll see an asset tag. That little tag tells a thief that the serial number is registered on a central database and will be given to the police in the event of a crime. Most law-abiding citizens don’t realize that criminals NEVER want to be caught with property that can be traced back to the rightful owner. Our miniaturized system protects individuals, homeowners and small businesses from burglary theft and loss—those not big enough to justify the huge, upfront costs of a full-blown and expensive strategy. Those tiny asset tags are the one little visible part of a billion dollar global industry segment called enterprise asset management (EAM) that is implemented primarily by Oracle, SAP, IBM, Sunflower Systems, A2B Tracking and Asset Smart. Only huge sprawling institutions can afford to implement this turnkey strategy. It’s the reason large universities are rarely burglarized, yet dorm rooms, apartments and homes around the university are. Amazingly, only 10% of residential and small business burglaries are ever solved. It’s really a national epidemic that’s like an oil spill—spread thin across the nation—so people don’t think anything can be done. Called Operation Identification, it’s a strikingly simple technique developed by the police in 1963 and rolled out nationally in 1979 by the U.S. Dept. of Justice. If you are ever a victim of loss, theft or burglary, the police will ask two things. What are the serial numbers of the items that are missing, and are those items marked in any unique way? This is how they solve crimes. As far as we know, MyPropertyID is the only company in the U.S. that provides our level of service. We also believe we have the global state-of-the-art, miniaturized enterprise asset management (mEAM) system—cutting edge in our own small way.